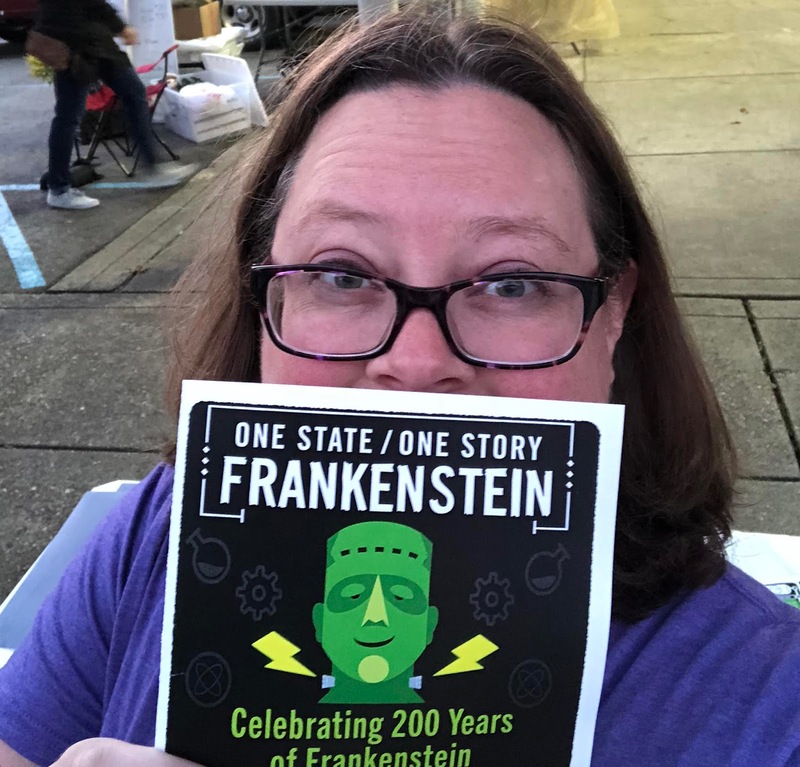 This October, my library participated in Indiana's One State One Story program celebrating the 200th anniversary of the original publication of Mary Shelley's Frankenstein. We've not done a program like this during my time at the library and I was so interested to see how it would go. I wasn't certain we could get people interested in reading a classic or engaging with us about it. Abby holding up our Frankenstein event booklet. It turns out we had a total blast and I can't wait for our next community read! Staff buy-in. We ordered everyone Frankenstein t-shirts that they could wear on Fridays or days that we had Frankenstein programs. Our town harvest festival happened during this month and we themed our library booth around Frankenstein and STEM, showing off our new 3D printer from the Makerspace at our branch and providing science activities for kids to stop in and try. This gave our staff concrete ways they could engage patrons in the discussion, whether or not staff members were willing to read Frankenstein (some did, some didn't). Marketing! Our marketing director created a really snazzy-looking booklet with all the Frankenstein related events so we could promote everything at once. Giveaway copies. 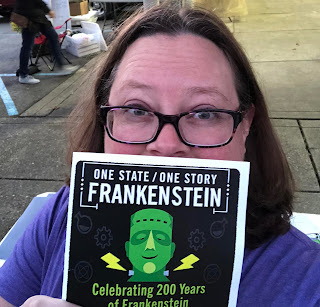 We won 50 copies of Frankenstein as part of our grant from Indiana Humanities, but we ended up purchasing 100 additional copies so that we could give out copies to all our book discussion participants and to other patrons throughout the month. This was possible in part because this particular book has many versions and is available at an affordable price. Being able to actually hand patrons a free copy got them excited about it and each copy had discussion questions inside (more on that later). A variety of events. We hosted STEM and Frankenstein-themed children's and teen programs, as well as a variety of programs for adults. Some of these were grant-funded and some were paid for from our normal programming budget. Special book discussions. 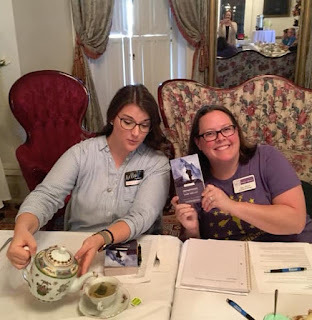 Instead of just holding our book discussions at the library, we held a Frankenstein Tea at a local state historic home and at our Carnegie building (which is now a museum branch of the library). These extra touches (and FOOD!) gave these events some additional appeal. One of the things that I tried and that flopped was posting discussion questions on our Facebook account throughout the month. My thinking was that people who might not come out for a program might prefer to engage that way and participate in the discussion. I used Indiana Humanities' "big idea" questions because they are more general questions that mostly do not require you to have read the book and linked to the downloadable ebook and audiobook available through Hoopla. I did not get any engagement on those posts, even when I commented and shared them myself. I still think there's something in creating an online book discussion, but next time I'd experiment with some different platforms, or maybe hold a discussion at a certain time, like a Twitter chat or even Facebook Live? 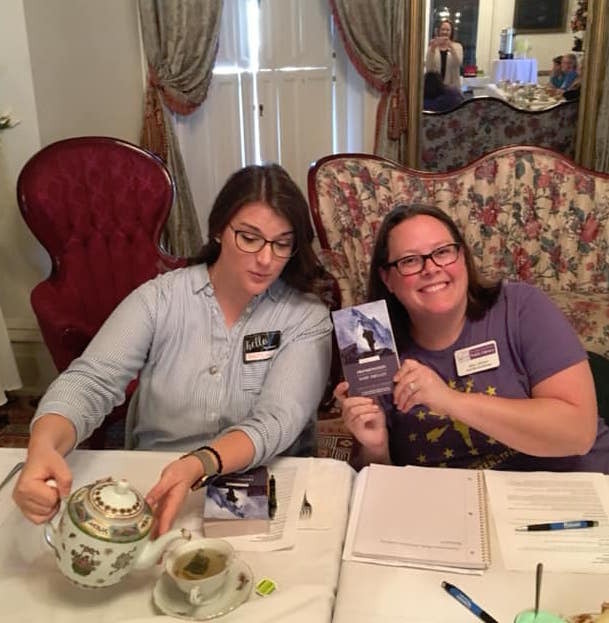 Book discussion leaders posing with tea and a book at the Culbertson Mansion. My big event of the month was our book discussion and tea, held at the Culbertson Mansion State Historic Site. It was really neat to be having a literary discussion in a similar kind of environment to where Mary Shelley began writing Frankenstein. It was my first time hosting a book discussion for adults and I was not sure how it was going to go. I utilized some of the discussion tips from the Indiana Humanities event guide and the event went REALLY well. I opened up our talk by asking everyone to go around and say their name and one word that describes how they feel about the advances in science and technology in our world. This was a nice icebreaker with vary varied responses that helped get the conversation started. I had prepared a TON of discussion questions beforehand, but I wanted the conversation to flow from the participants, so I let that happen as much as possible and only chimed in with my questions if we seemed to have reached a stopping point. I wish I had made the event longer - we could have talked about Frankenstein for another hour, I think! Lots of libraries around the state participated in One State One Story and I'm pleased that it was so well-received by our patrons and staff. I can't wait to hold another one! Have you done a community read at your library? What tips would you share?